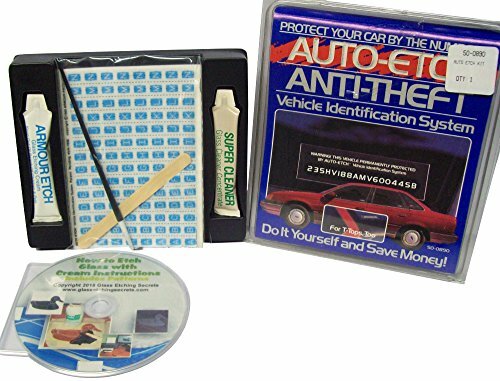 This VIN etching kits allows anyone to easily and permanently mark vehicle identification numbers on windows of cars, trucks, vans, etc. Each kit contains 6 alignment templates and enough numbers and letters to re-create any number up to 18 digits long. These templates and stencils are specially designed to adhere to glass when rubbed into place. Armour Etch glass etching cream is brushed onto the stencil and after 1 minute, the etching cream and stencil are removed from the glass using a sponge and ordinary tap water. The etched VIN number is permanently etched into the glass. Includes one free how to etch glass CD. The letters and numbers measure approximately 1/8" wide by 3/16" inch tall. Permanently etch federally registered VIN on car windows. Protect cars from theft with patented Auto Etch system. 6 alignment templates to etch up to six windows or cars and 2 decals. Four sheets, totaling 448 letters and numbers measuring roughly 1/8" wide by 3/16" inch tall. Brush, stirring stick and etching cream included. Plus a Free How to Etch CD. If you have any questions about this product by Auto Etch Anti-Theft Vehicle Indentification System, contact us by completing and submitting the form below. If you are looking for a specif part number, please include it with your message.